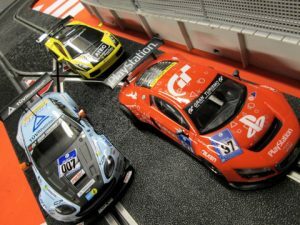 These regulations are applicable to 1/32 scale entry-level models of mixed GT cars. The formula is designed a starting point for the novice or club racer to become accustomed to DiSCA GT racing using mostly standard specification model cars and equipment, with some scope for performance enhancing modifications. The formula is intended to become a stepping stone en-route to racing GT3 Euroseries. The formula may also be applied to models of box-stock saloon cars such as the Hornby BTCC (NGTC generation) and Carrera DTM. It is the recommendation of the association to race like-brands together as these specifications do not serve as a balance of performance across makes. Cars must use in-line motors except in the case of older Scalextric models, where the standard sidewinder configuration is allowed, OR the car may be converted to in-line using an aftermarket 3D-printed chassis. The original 20,000rpm motor must be retained. Gears may be replaced but must retain the original ratio of 3.0 to 1. Wheels may be replaced ut must be the same size as the original equipment. The use of traction magnets, the specification of the rear tyre compound and other variables covered in the full text are left to the discretion of the race director to apply local restrictions and controls, to suit the environment in which the standard is applied. The administration of race events and authoring of standards, tutorials and all of the association’s material takes considerable time, effort and dedication by those involved. Please take a moment to consider making a donation in acknowledgement of the association’s work, thereby providing the means to further our efforts toward the future of digital slot car racing . ERROR: Error validating access token: Session has expired on Thursday, 04-Oct-18 08:02:04 PDT. The current time is Saturday, 20-Apr-19 17:49:29 PDT.